Let Wash Club Cleveland do the Dirty Work + Enter to win! I was provided with this service to try for the purpose of this review and sweepstakes. Laundry is one of the few chores I don't mind doing, but it is the most time consuming. Just imagine if you could fill a bag, leave it on the porch, and have it returned 24-hours later washed and folded. Well, Wash Club Cleveland offers this service at competitive rates. 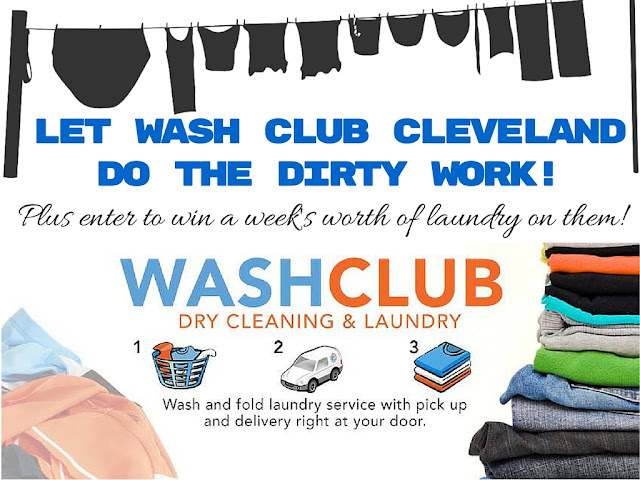 I've never really considered trying a laundry service, but when Wash Club Cleveland reached out to see if I would like to try their service (and offer a chance for a reader to win) I could not pass up the opportunity. Not only was it fantastic not to have to worry about the laundry for a week, but the whole experience was easy and the staff very friendly. Getting started on Wash Club Cleveland's website was simple! I simply went to the site, clicked on the 'get started' button and checked to see if the service was available in my corner of Northeast Ohio. I scheduled the pick up in the morning and our dirty laundry was picked up that afternoon. 24-hours later, our laundry was delivered cleaned, sorted, and folded. The waterproof sacks that held the laundry will make the next order easy to put out for pick-up. And, as it turns out, our laundry was 32 pounds which would have only cost $36.80. Besides, being able to track the progress of my laundry online, there is an app (apple and android), and they keep you up to date via text. When it came time to drop off my order, the driver called to see if I'd like my order early! The driver would have also just left it on the porch where it was picked up the day before. The week I tried Wash Club I was getting over being sick and our laundry was not top on my priority list. I can't express the relief it was not to worry about laundry! This service is not something that would fit in my weekly budget, but it is certainly reasonable to utilize whenever we need it like during the busy holiday season, after the holidays, before and after a trip, or when the laundry is just getting to be too much to do. They also have gift certificates which would make a great stocking stuffer! Now it is your chance to have a week's worth of laundry done for you with Wash Club Cleveland. Enter using the gleam app and refresh if it does not appear or if there are any problems. Bonus! Check out WashClub Cleveland and use coupon code "marylakewood" to save 25%!